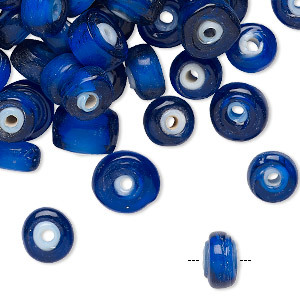 Bead, glass, blue/white, 13x9mm rondelle. Sold per pkg of 24. Item Number: H20-5826GL Have a question about this item? 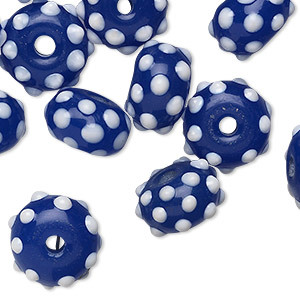 Blue and white lampworked rondelle beads bump your jewelry creations to a playful style. Expertly crafted by skilled glassmakers. Sizes, shapes and colors may vary with handcrafted items. 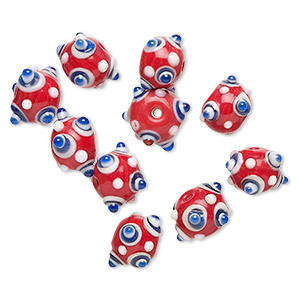 NEW - Bead, lampworked glass, opaque red / blue / white, 12x10mm-13x11mm bumpy rondelle with 1.5-2mm hole. Sold per pkg of 10. 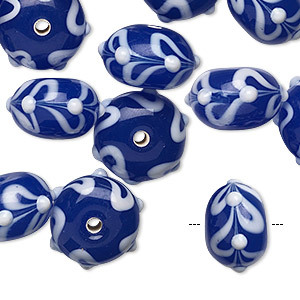 Bead, vintage India lampworked glass, translucent blue with white center, 7x5mm-11x7mm rondelle. Sold per pkg of 100. 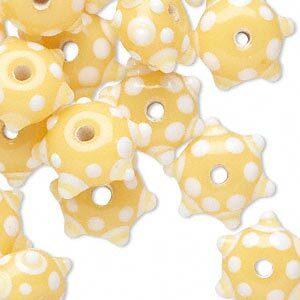 Bead, glass, yellow/white, 13x9mm rondelle. Sold per pkg of 24. 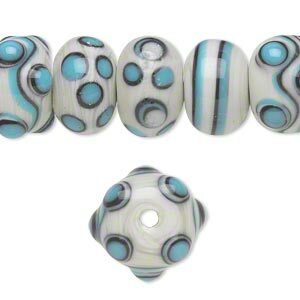 Bead, lampworked glass, translucent blue and white, 13x9mm bumpy rondelle. Sold per pkg of 10. 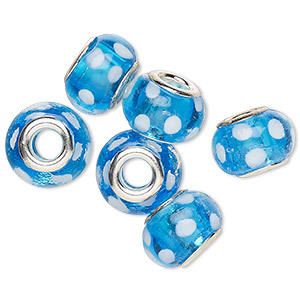 Bead, Dione®, lampworked glass and silver-plated brass grommets, semitransparent aqua blue / pink / white, 14x9mm rondelle with flower design and 4.5-5mm hole. Sold per pkg of 6. 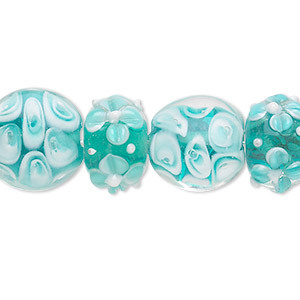 Bead, lampworked glass, clear / white / aqua, 13mm-18x10mm bumpy rondelle with flower design and 13-18mm puffed flat round with flower design and 2.5mm hole. Sold per pkg of 16. 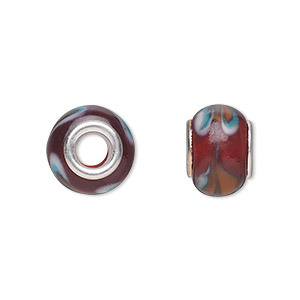 Bead, Dione®, lampworked glass with silver-plated steel grommets, dark red with swirls, 14x10mm rondelle with 4.5-5mm hole. Sold per pkg of 6. 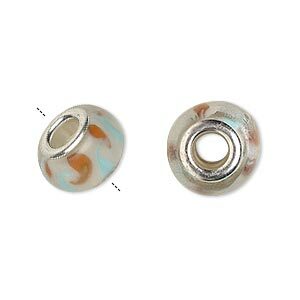 Bead, Dione®, lampworked glass with silver-plated steel grommets, white with orange and light blue swirls, 14x10mm rondelle with 4.5-5mm hole. Sold per pkg of 6. 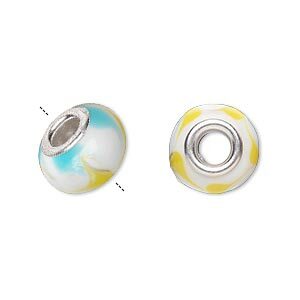 Bead, Dione®, lampworked glass with silver-plated steel grommets, white with aqua and yellow swirls, 14x10mm rondelle with 4.5-5mm hole. Sold per pkg of 6.